The first Bharatiya Janata Party government in Maharashtra headed by state party chief Devendra Fadnavis will be sworn in on Friday with Shiv Sena unlikely to join the new dispensation for now as talks continued between the two saffron parties for a tie-up. Fadnavis, 44, a four-term MLA from Nagpur, will be administered the oath of office by Governor C Vidyasagar Rao at Wankhede Stadium in the presence of Prime Minister Narendra Modi, several of his Cabinet colleagues, chief ministers of BJP-ruled states, corporate leaders, Bollywood stars and other celebrities. A small Cabinet of around ten ministers including state BJP Core Committee members Eknath Khadse, Sudhir Mungantiwar, Vinod Tawde and Pankaja Munde besides MLAs from Schedule Castes and Scheduled tribes is also likley to be sworn in. "A slim and trim government will take oath tomorrow," a BJP leader said. As talks with former ally Shiv Sena for a possible tie-up are still going on, no minister from that party was likely to be inducted on Friday. "It seems unlikely that any Shiv Sena minister will be sworn in tomorrow. Talks with Sena are on in an amicable atmosphere for a possible tie-up in Maharashtra but there has been no outcome yet," BJP General Secretary Rajiv Pratap Rudy. Maintaining that BJP was looking forward to a decision soon, he said, "This may not happen tomorrow." BJP had emerged as the single largest party in the 288-member state Assembly with 122 seats but one of its MLAs Govind Rathod died. Though technically it will be a minority government until Sena joins it, declared support from 41-member NCP will act as a hedge for the BJP dispensation. It also has the support of several Independent MLAs and those from some smaller parties. Meanwhile, Shiv Sena chief Uddhav Thackeray is likely to hold discussions with senior leaders again on Thursday evening and announce the party's stand on joining the government. Sena MP and spokesman Sanjay Raut said "positive talks" were on between the two parties and extended best wishes to Fadnavis and his team. "A new government led by Devendra Fadnavis is being formed. Like always, we wish him well. He is a capable, young leader with clean image. We want him to get the opportunity to take Maharashtra forward," Raut said. He, however, went on to add that people's mandate was not for any single party. "BJP has emerged as the single largest party and we are second. In the given situation, if the two parties form a government, it will be stable," Raut said. Asked if the option for sitting in the opposition was open for Sena, Raut said, "We are not standing at somebody else's door. "We have and old relationship with BJP. We fought elections separately. This happens in politics. But attempts have been made to erase the bitterness. If BJP is forming government, it is our duty to extend best wishes to them," he said. On whether Uddhav will attend the swearing-in ceremony for which he has been extended invitation, Raut said, "Please wait till the evening." Earlier, in an editorial in its mouthpiece 'Saamana', Sena praised Narendra Modi and Fadnavis, saying the state can expect 'acchhe din' (good days) under them, but cautioned its former ally against accepting NCP's support. "You (Devendra Fadnavis) come from the Vidarbha region where the NCP had carried out a huge irrigation scam. By taking NCP's support from the very beginning, questions have arisen on the sanctity of your government," the editorial on the eve of the swearing-in. "The biggest challenge for BJP right now is to prove majority in the Vidhan Sabha. It is okay to say that you will form a minority government and even manage to run it. But running such a government is against the Constitution. "(Sharad) Pawar has extended support without being asked for it, but will the (Devendra) Fadnavis government run with the help of Pawar's support?" it said. 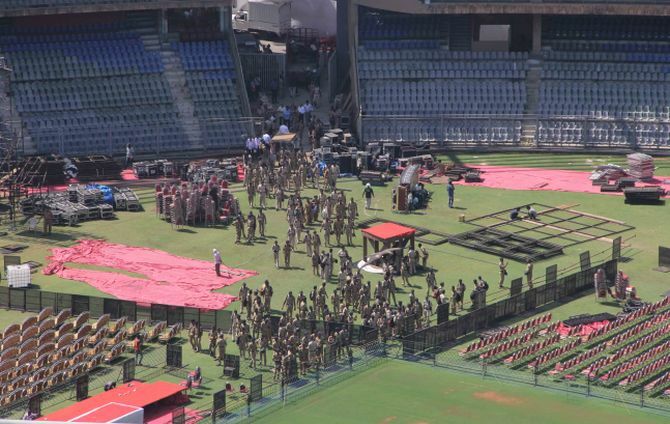 The oath-taking ceremony at Wankhede Stadium will be a glitzy affair with around 40,000 guests likely to be present. Invitations for the event have also been sent to Uddhav Thackeray, NCP chief Sharad Pawar, former Chief Minister Prithviraj Chavan and other top politicians. Corporate giants including Ratan Tata, Mukesh and Anil Ambani, Anand Mahindra, Adi Godrej, singing legends Lata Mangeshkar, Asha Bhosle, actors Amitabh Bachchan, Salman Khan, Aamir Khan, Shah Rukh Khan, Hrithik Roshan, cricket icons Sachin Tendulkar and Sunil Gavaskar are among those invited for the event. Fadnavis met Modi, BJP president Amit Shah, Union Minister Nitin Gadkari and other senior leaders in Delhi to personally invite them for the swearing-in. It is for the first time that such an event is being organised at the famous cricket ground. In 1995, when BJP came to power in alliance with Shiv Sena, swearing-in had been held at Shivaji Park. Sharad Pawar-led Mumbai Cricket Association has said it will not charge any fee for its use. Pawar's party NCP has offered outside support to BJP in government formation. BJP has roped in noted Bollywood art director Nitin Desai to design the stage decor which will have giant cutouts of lotus, the party's election symbol. 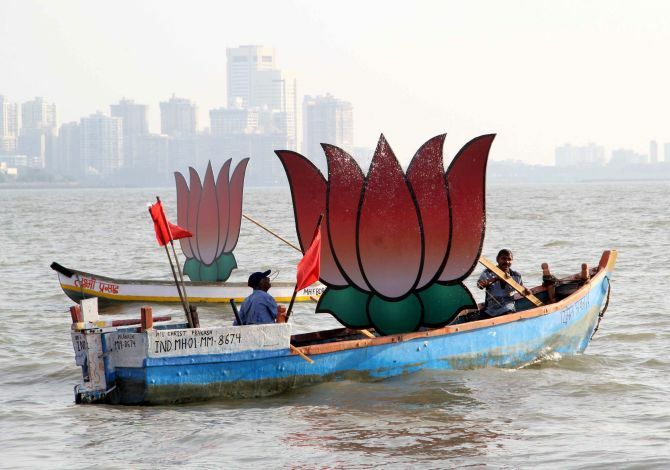 Mumbai BJP General Secretary Atul Shah said the theme of the programme was inspired by former Prime Minister Atal Bihari Vajpayee's statement in 1980 that he would like to see the lotus bloom on city seafront. "The stage, with seating capacity of 200, will be semi-circular, to align with the stadium's outline. 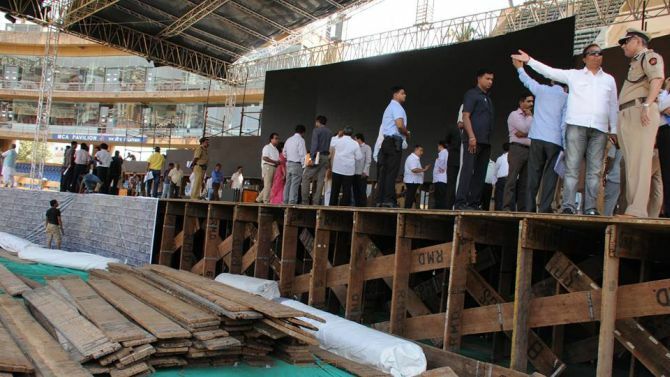 An LED screen has been installed to ensure that everyone present gets a good view. It will be a modern and hi-tech stage which will also highlight the ancient culture of the state. There will be depiction of Shivaji Maharaj's coronation as well," Desai said. He said the vision of the new government will also be highlighted. 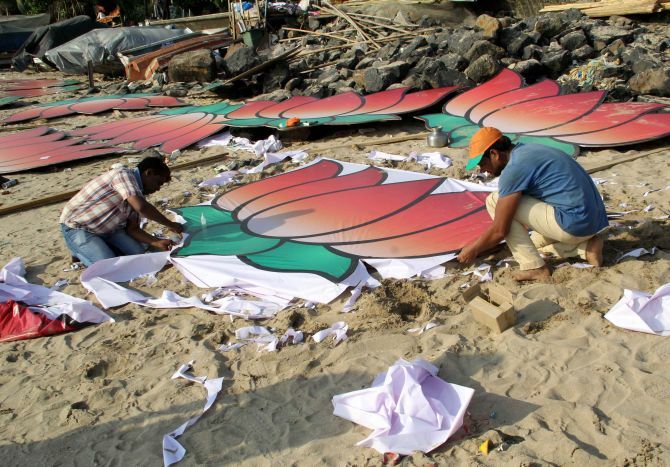 BJP functionaries were today busy giving finishing touches to preparations for the big day. Mediapersons were on Thursday shown a glimpse of the big lotus replicas bobbing up on the Arabian Sea that will be visible from the iconic Marine Drive.